Sial Sharif is a village in the Sargodha District of Punjab, Pakistan. It is located in Sahiwal Tehsil and lies 48 km (30 miles) away from the city of Sargodha, about midway on the Sargodha-Jhang road. Its population is about 1,100 people (1998). 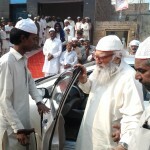 The local language is Punjabi.Sial Sharif is famous for the Sufi shrine of Khwajah Muhammad Shamsuddin Sialvi, popularly known as Pir Sial, who was a waliullah (saint) belonging to the Chishti order. His descendants, all of whom are believed to have reached the highest levels of sainthood (one of them is explicitly designated by the title Qutb-al-Aqtab), are also buried in the same shrine. Today the Khanqah (Zawya, i.e. Sufi convent) of Sial Sharif is counted among the foremost Chishti centres of the Punjab, and indeed of the whole Indian subcontinent. 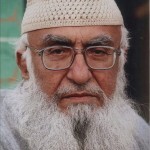 Many spiritual personalities are or have been associated with Sial Sharif. 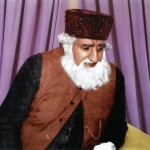 Most notably, Pir Meher Ali Shah of Golra Sharif, the famous saint of the 20th century, was a faithful murid (disciple) of Pir Sial of Sial Sharif. 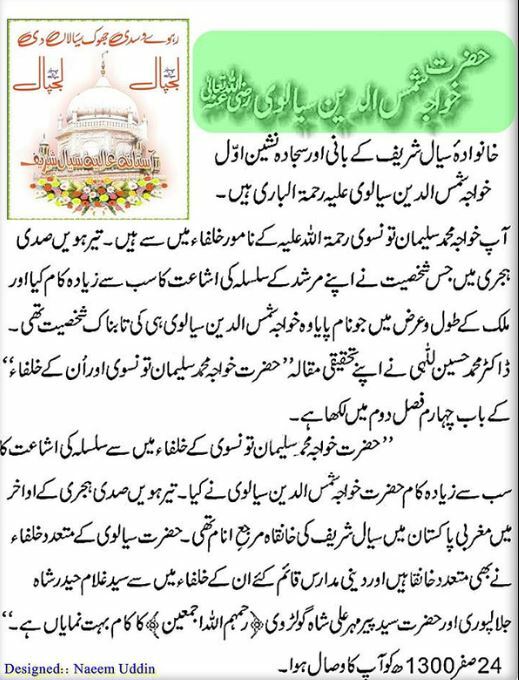 Hazrat Pir Syed Haider Ali Shah sb, astana Aalia Jalal-Pur Shareef, These two were most prominent mureed of Pir Sial Lajjpal also so many others like Pir Muhammad Karam Shah Al-Azhari of Bhera Sharif,Hazrat Molvi Abdul Ghani Chisti of Bareela Sharif and Pir Syed Rustam Ali Shah of Sarachha, Azad Kashmir. To this day, the Islamic spiritual tradition is very much alive in this (Nizami) branch of the Chishti order. Its barakah (spiritual influence, blessing) is experienced by tens of thousands of disciples and visitors. Every Friday, scores of devotees travel long distances just to attend the Jumu’ah prayer there and obtain some blessings from the Holy Shrine. Attached to the spiritual centre (referred to as Darbaar, i.e. court) at Sial Sharif there is also a religious school (madrasa). 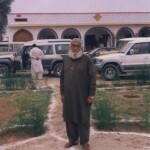 Many other religious schools and mosques, scattered throughout Pakistan, are affiliated to the Darbaar of Sial Sharif. The Darbaar at Sial Sharif is closely linked to many other spiritual centres, including the Darbar at Bhera Sharif. Muhammad Din was a son of Khwaja Muhammad Shams Din and succeeded him as head of the Sial Sharif shrine on his demise. After Khawaja Shams al-‘Arifin, his son, Khawaja Muhammad Din, sat upon the spiritual seat as an embodiment of the qualities of his father. He gave this movement of his noble father further strength and energy. Muhammad Zia-al-Din of Sial Sharif was a son of Khwaja Muhammad Din and succeeded him as head of the Sial Sharif shrine on his demise in 1909. 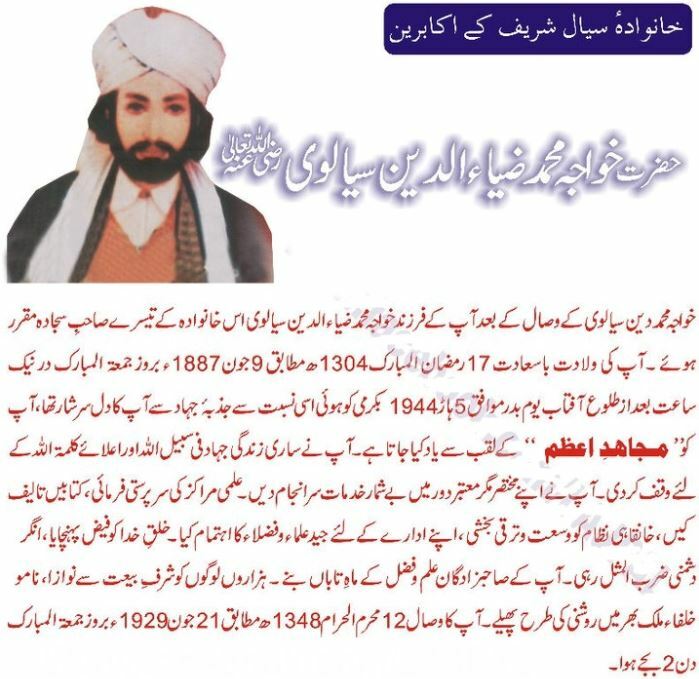 He was born on 7 July 1906 in Sialsharif. 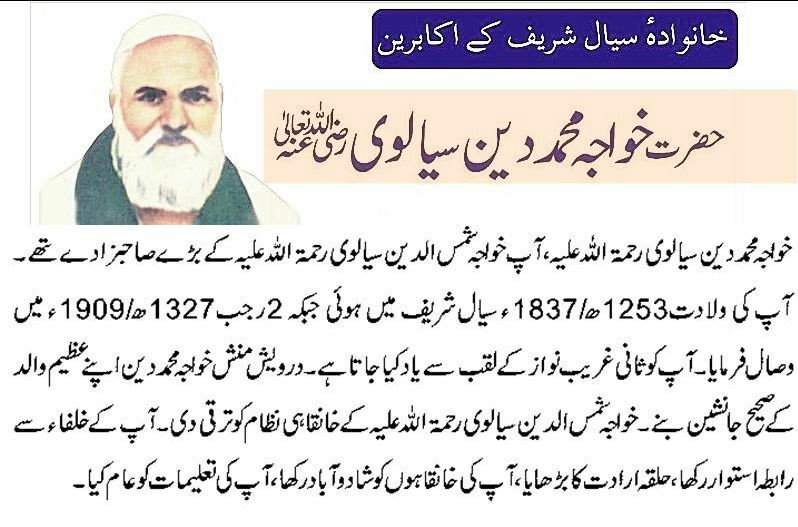 He was the eldest son of Zia-ud-din Sialvi. He became the president of Sargodha Muslim League. He went to all corners of subcontinent to vote for the Muslim League in the election of 1946. He particularly walked along with Pir of Zakori in NWFP to vote for Pakistan in the referandum of 1947. In the Indo-Pak war of 1965 he donated all the ornaments of his family to Pakistan Army. 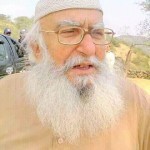 In 1970 he became the president of Jamiat Ulema-i-Pakistan. 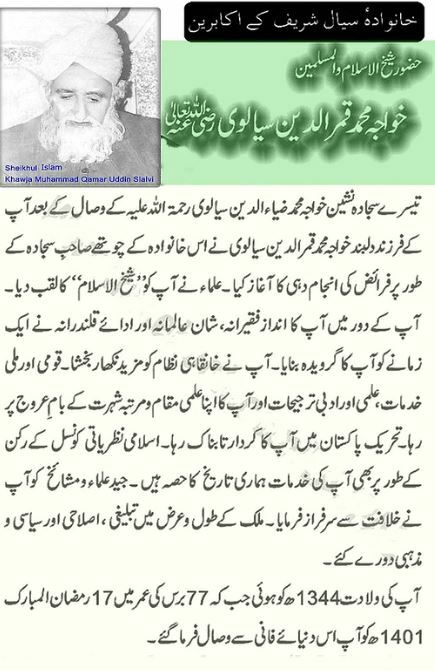 He was nominated member of Islamic Ideology Council, twice. He died on July 20, 1981. He was awarded Tamgha-e-Imtiaz(Medal of Distinction) by president of Pakistan in 1981. 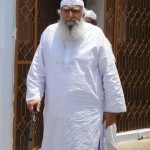 Hamid-ud-Din Sialvi is eldest son of Qamar-ud-Din Sialvi and the present-day Sajjadah Nashin of the Sial Sharif shrine. He can be credited for much of the development to Darbar and the attached mosque (with funds provided by the followers or Mureedeen of Sial Sharif) which has made available much larger space for offering prayers. This development includes construction of a new Langar Khana(a place where anyone can have a free meal) which is serving the needy even better. May Allah SWT grant you the wisdom, health and wealth sadqa of Rasul-Allah Sallalhu Alihe Wasallam and hazoor pir sial and accept our duas. Ameen. Ya Rabi Alameen.